One of the most fascinating things about succulents is that they’re able to be propagated — it’s like nature’s little gift to plant growers. If you learn how to propagate succulents from leaves, you can end up with tiny replicas of your favorite succulents in just a few months. That means you’ll be able to enjoy new plants without having to pay for them individually! Propagating succulents is another reason to love these hardy plants and it can also be a big money saver. Once I learned how to propagate succulents, propagating became a treasured hobby of mine. If I bring home a succulent I wish to multiply at some point because of how beautiful it is, I start the propagation process, which is not only easy but fun! Now that you know why you should start propagating, let’s delve right into the details of how to propagate succulents from leaves so you can get started asap! First, lets quickly cover stretched-out succulents because they’re the perfect starting point for propagation. Have you ever wondered why your succulents go from tightly-shaped rosettes to tall, stretched, and leggy? The answer is simple: succulents stretch upwards and outwards because they’re not getting enough sunlight. What they’re doing is stretching themselves towards a light source in an effort to get the sunlight they need to survive. This is why you’ll often see tall, unusual looking succulents that were once tightly shaped. It can be frustrating! The official name for this process is etiolation. It’s something you’ll aim to avoid but it will happen from time to time if you keep your succulent in a spot that doesn’t get at least a few hours of sunlight each day. Don’t worry, though, etiolation doesn’t mean your plant is going to die tomorrow, it’s just a warning sign that your plant should be moved towards the light so it can get the nutrients it needs to thrive. Remember, while succulents can burn under full sun and intense heat, they do need sunlight. Keeping them in full shade throughout the day is what starts the etiolation process. To avoid this, move your succulents to a brighter area of your house or yard. Unfortunately, once a succulent has stretched out in search of light, there’s nothing you can do to revert it back to its previous shape; I wish there was! Once that process begins, it’s a done deal. 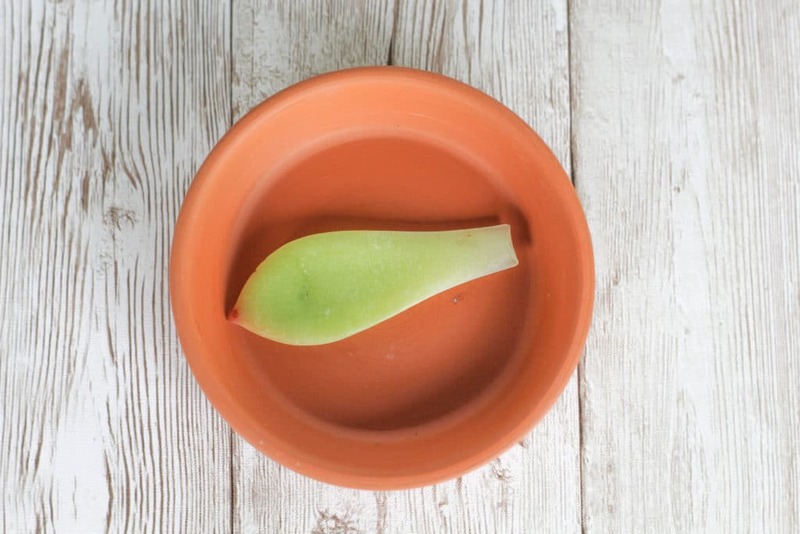 What you can do, however, is start new succulents from the leaves of your stretched out succulent via a very easy propagation technique. 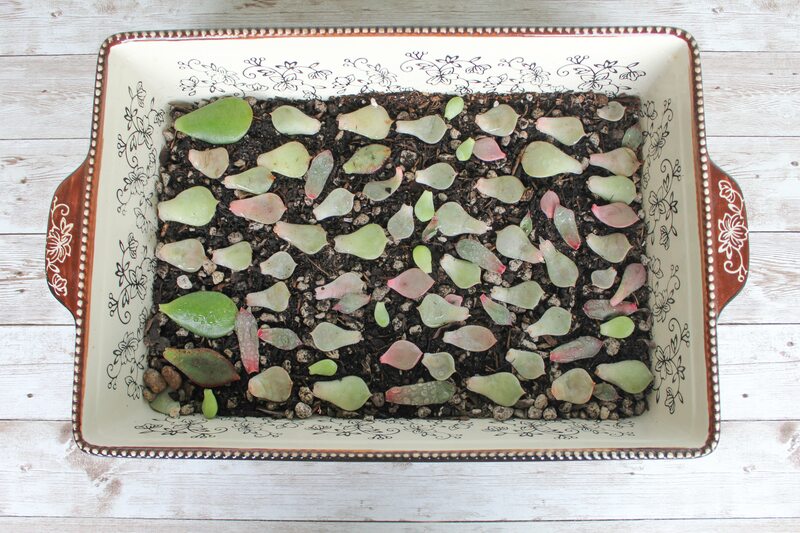 All you need for propagating succulents is a few leaves picked off of a healthy succulent. 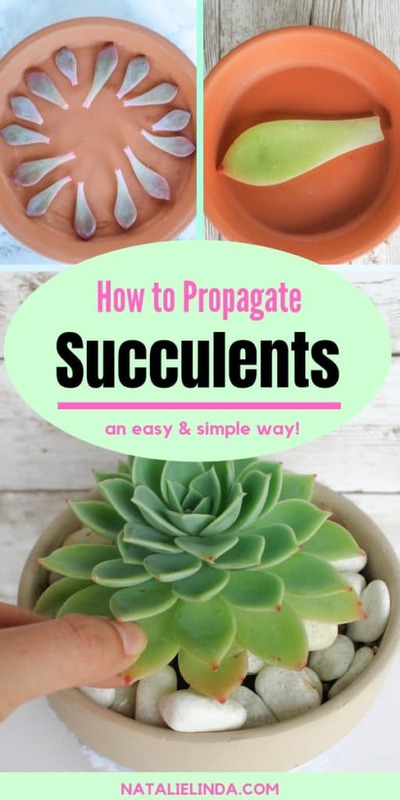 To get started, go over to the succulent you want to propagate. I usually look for succulents that have stretched out from lack of adequate sunlight; it’s my way of “fixing” succulents that aren’t as pretty as they once were. The leaves you propagate should be healthy for the most part, which means that they’re not dried out or rotting. To avoid making your current succulent look strange, I recommend taking the leaves or leaf from the bottom of your succulent. This way, you won’t have weird-looking empty gaps or spaces from the middle or top of your current succulent. To separate a leaf from your plant, simply grab the leaf with your fingers and gently tug at it back and forth from side to side until the leaf breaks off from the base. It should tear off rather easily. The important thing to remember here is that you want a clean break from the stem of the plant because this will give the plant the best chance at growing roots. Refer to the photo below for how your leaf should look after you tug it away from its stem. See how straight the cut is? It didn’t tear diagonally or into the flesh of the leaf. When you have all of your leaves ready, set them aside for a few days so that the ends form calluses. This will help ensure that the roots don’t rot when they’re exposed to moisture and soil. You’ll also want to keep them in the shade because they might sunburn if left in direct sunlight. Once you see that the ends of the leaves have formed calluses, (the ends will appear dry, brown, or “sealed in”) then it’s time for the next step! Cactus mix is simply a mix of sand, pumice, small sticks, and soil that is mixed together to form an ideal growing environment for succulents and cacti. It provides the right amount of water retention and air circulation that allows the roots of succulents to thrive. Succulents soil aka cactus mix is recommended for planting succulents indoors and outdoors, and it’s perfect for propagating succulents, too. While whole succulents should be planted in soil, succulent leaves that are to be propagated shouldn’t be planted, but placed on top of the soil – not in the soil! Planting your leaves in soil won’t get you good results, in fact, your leaves may end up rotting away if you try to propagate them this way. Laying them on top of succulents soil or cactus mix gives the leaves time to grow roots that will eventually grow succulent babies in a few weeks. The leaves will gather nutrients and water from the air and soil around them, so don’t worry! I recommend using a large saucer, as shown above. I’ve even used a 9 x 13 ceramic baking dish to propagate a large number of succulent leaves. The baking dish had formed small cracks on the bottom of the pan, so I was no longer using it for baking. I figured I could repurpose the baking pan for my gardening tasks and it has worked out great for me. Any container or lid with a flat surface will do; there’s no need to spend any extra money here. Fill your saucer or container with soil and then lay your leaves right on top of the soil, as shown below. The most important thing when learning how to propagate succulents, apart from tearing off the leaves correctly, is to water your leaves every day; your spray bottle is about to come in very handy! 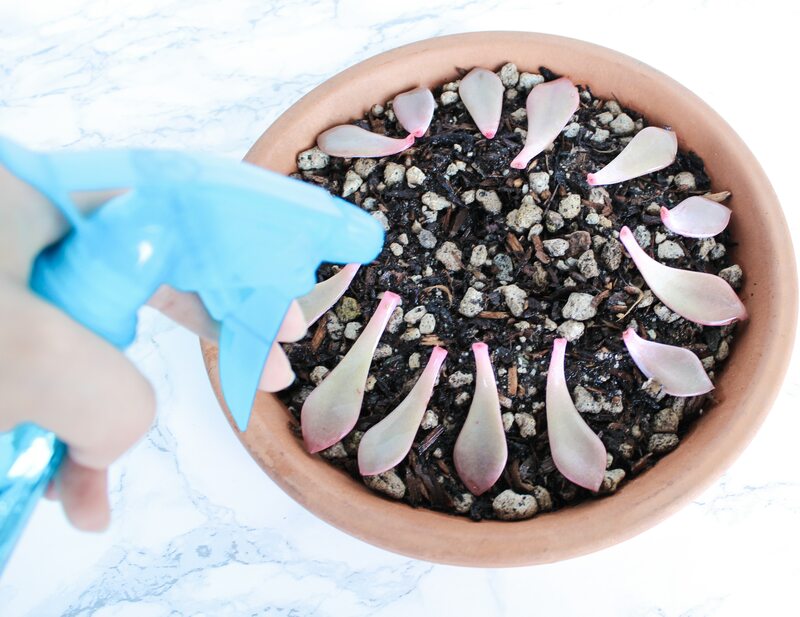 While it’s true that you shouldn’t water your potted succulents with a spray bottle, watering succulents leaves is a different matter altogether. (Read my How to Water Succulents post for more information on how to properly water your potted or outdoor succulents). During propagation, it’s very important to keep your soil moist, so get into the habit of watering your leaves every morning. Simply take a spray bottle that’s filled with water, and dampen the soil, as shown in the photo below; a few spritzes a day will do. The leaves will get moist in the process, but that’s okay. The important thing here is to make sure the soil gets water because this is what will help your leaves grow roots. 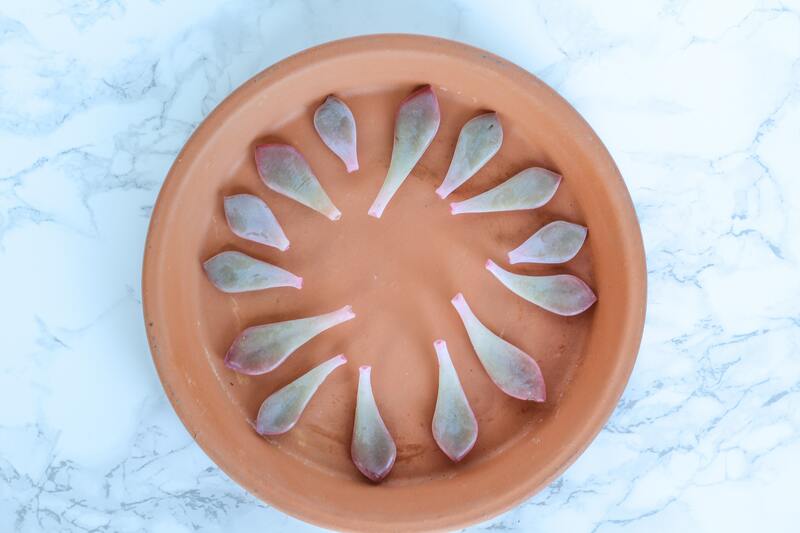 At this point in the propagation process, you can move your succulent leaves to a spot that gets a few hours of sunlight each day. 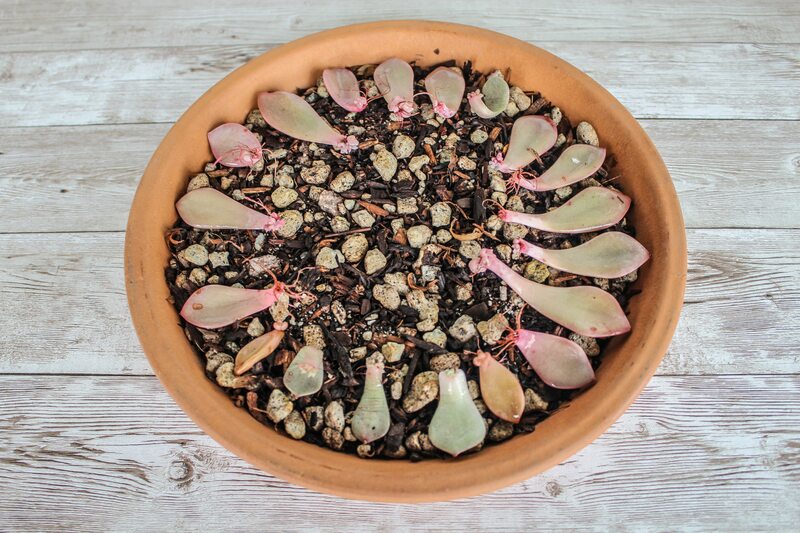 Propagating Succulents Takes Time – Be Patient! Propagating succulents takes several weeks, even months before you see a succulent baby that is large enough to plant in a pot or in the ground. After about 3 weeks, you should start to see your leaves grow roots. Don’t be alarmed if some of your leaves never grow roots because not all leaves will propagate. In fact, some of the leaves that do grow roots will never form a baby rosette, unfortunately. A good majority of the leaves I’ve propagated do grow roots — I would say about 30% of them never do. If I have any leaves that haven’t grown roots in several weeks, I simply toss them out. I do the same thing with rooted leaves that don’t form rosettes after a while. Look at the picture below, this is what your leaves should look like after a few weeks of laying in the soil and being watered every day. See all the roots coming out of the leaves? Those roots are beginning to form tiny little succulents babies that will grow larger in the next few weeks. Keep watering them and be patient! Once your leaves have formed tiny replicas of its original succulent and are about the size of a dime, it’s time to start cutting back on watering. When you stop watering, the baby rosettes will start to get their nutrients from the original leaf, which is going to help it grow larger and it may even begin to sprout more roots. Cutting back on watering from once a day to every three days or so will cause the original succulent leaf to dry out. 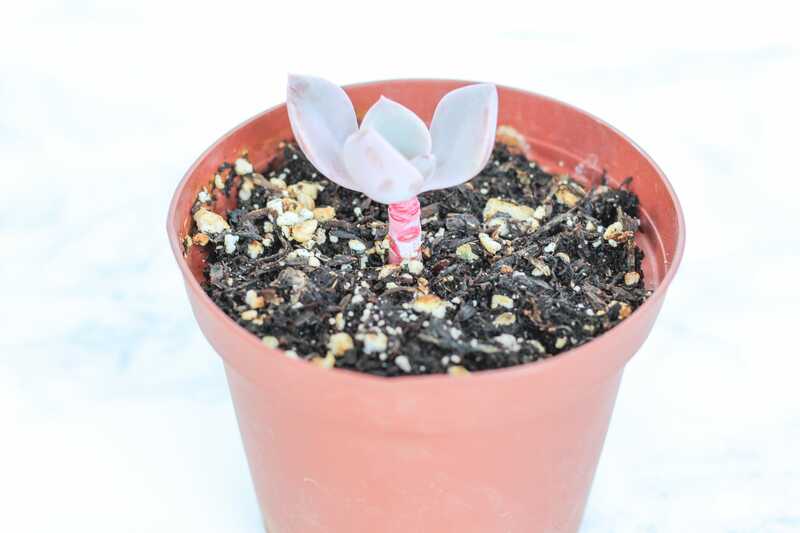 When the baby succulent grows larger than an inch, then you can tear it away from the original leaf, but be careful not to harm the remaining roots in the process. 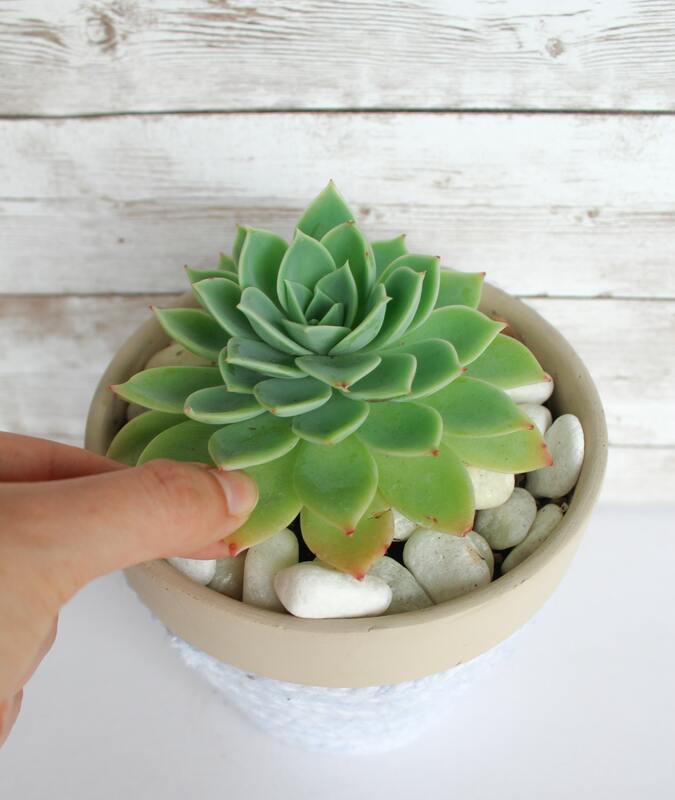 After you gently pull off the original leaf, you can pot the rooted baby succulent in its own pot and start to care for it like any other potted succulent! Another option is to plant it with the original leaf still attached and simply let it wither off on its own. Check out my How to Care for Succulents post for a refresher on what to do now that you’ve created a new succulent! Wasn’t that easy?! 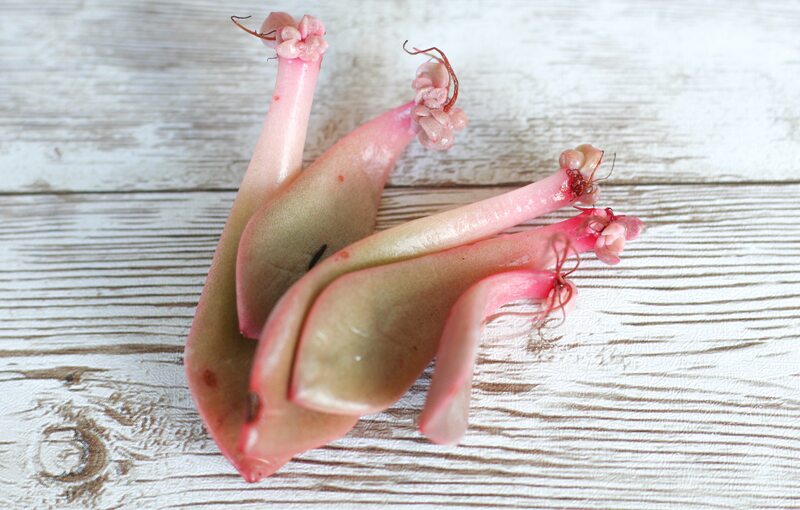 Now you can go out and start propagating your own succulents! I’m sure you’ll love the results. Good luck and if you have any questions, leave me a comment below. FOR MORE ON GROWING SUCCULENTS, CHECK OUT THE POSTS BELOW!